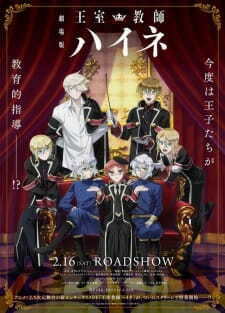 Alright, I'll start off with this: This movie is definitely for those who are fans of the Royal Tutor anime, like myself. If you're new, then it is best to watch the anime first before the movie or you're not gonna care much about these characters. If you didn't like the anime or someone who's looking for something grand to happen in the movie, then you might be disappointed. One way to describe this movie is that it felt like I just watched one long episode of The Royal Tutor but with two new pretty boys. So nothing new really happens story wise if you're familiar with the anime. If you're hoping to learn something about Heine or see more of the princes and their story, then this movie might be a letdown. Like always, this anime just loves to make hair seem as amazing as possible. But for real about the art, it's pretty much similar to the anime, so nothing breathtaking. Though, I do notice the increase of 3D animation and it can be very distracting once you notice. It does not really mesh well and can look a little wonky. The soundtrack is enjoyable and a good one for this movie, so I don't have any complaints. The ending song is pretty cute too and loved listening to it. Again the characters will seem meh if you never seen the anime before. So if you're familiar with them, you'll still love these guys. Though, the focus of the movie will be these two new princes. And they're pretty decent characters and would like to see more of them if the anime does get a season two. Heine did not get that much focus as I hoped. The four princes have an even amount of screen time, though Licht and Leo get shining moments on their own. Sadly, Eins doesn't get much screen time. The interactions between the characters are just as enjoyable as the anime and a lot of fun to watch. While I did enjoy this movie, I gotta say that it's nothing too special since it pretty much is like one big episode. If you enjoyed the anime and don't mind that it's like watching an episode then I recommend it! If you're someone that wasn't a fan of the anime, then I would say skip the movie.